Packaging machinery is used in most production facilities to ensure the quality and safe delivery of finished products. However, there are a variety of different packaging machines designed for many different applications. There are many reasons why a production facility would choose to use one type of packaging equipment over another. Below is an overview of these two main categories of packaging machines and reasons why one would be used over the other. The most basic equipment is a manual packaging system in which products are delivered via conveyor, pallet or cart. This method is still used today despite more modern automated packaging methods that are available. The reason for the use of manual packaging machines rather than automated equipment varies depending on the company. Most common reasons include: the need for manual inspection of product, fragile products, products that are odd shaped or not consistent in shape or size and the price of an automated system may outweigh the time saved due to a smaller quantity of products to be shipped. For example, precious metal coins or bars are usually manually packaged since they require final inspection and are easily scratched. Use of automated packaging machinery could allow defective products to be shipped or even cause imperfections. In this same example, it is important that precious metal products are vacuum sealed and firmly positioned in their trays. If the seal is broken, the metal can oxidize during shipping causing the entire tray to be unusable. Also, coins can rub against each other during shipping causing scratches and other imperfections. For this reason, precious metals are typically manually inspected, weighed, sealed and secured on pallets to ensure the quality of the product upon arrival to its destination. 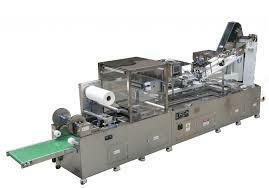 Automated packaging machinery is usually very fast moving and repeatedly performs the exact same functions. This is not ideal for small, fragile or custom made parts. They are most commonly used in production facilities where output of product is constant. Another common aspect is the uniformity of the products being produced. For example, bottling companies use automated machines to seal bottles which are all the same size and shape. Also, the output of bottles is constant and placement of them into cardboard or plastic packaging can be completed without worry of damage to the product. Other examples include the packaging of steel nuts and bolts which can be fed into hoppers via conveyor belt. The hoppers can release the required amount of parts into each bag to be sealed and placed into boxes. The boxes can be taped automatically and placed onto a conveyor to be delivered to shipping / receiving. Alternatively, many companies may use a combination of manual and automated packaging machines. This can be useful for companies who produce a large volume of products that require manual attention at certain points in the shipping process. An example of this would be the packaging of DVD’s or CD’s which the disc may be manually placed into the cases. The cases themselves can be sealed with plastic and sealed in boxes by automated machinery.